HOW TO COLLECT YOUR CAR HIRE AT FARO AIRPORT? 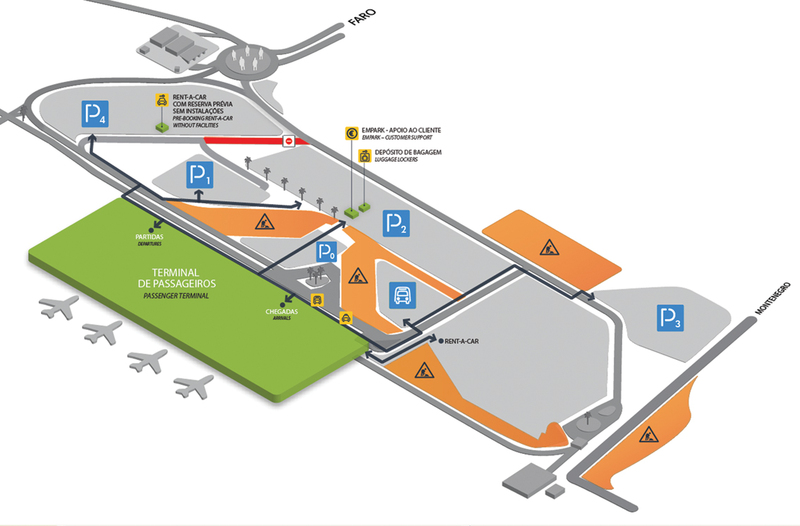 When you come from the arrivals, after you exit the airport building, turn left and walk down in front of the building until in front of the departures area. Opposite the building, on the other side of the road, just 50 meters from the building to your left hand side, you'll see Car Park 4 and the sign "Pre-booking rent a car". You can find our staff in the small office in park with (Myalgarvecars) logo on the clothes (as in the top of this letter). If you do not see the airport rep or if you get lost you may call him on 962457314 or 289502204. There is a public phone near the arrivals area. You may alternatively between 09.00 and 19.00 call the phone number 289502204 and our office staff will call the airport rep for you. Please note you may need to dial a national code to call Portuguese numbers (00351). Myalgarvecars.com inform that beginning on the December 8, 2011 the A22 (Via do Infante) shall be subject to electronic tolls. Please be aware that the toll sections are clearly marked, before starting with a panel of "electronic toll haul." When you choose to use the A22 Via do Infante-may regulate the subsequent payment plus administrative costs, within 5 working days, making the payment in CTT stations, network Payshop and elsewhere that may join the system, simplyindicating the plate number of the rented car. MYALGARVECARS.COM is a car rental company, and declines any responsibility for any offense committed with the rented vehicle at the contracted period. Since we have no ownership or the effective management Myalgarvecars should be acquitted in accordance with the provisions of applicable law. WHERE CAN I FIND THE TELEPHONE OF THE COMPANY? On the Company Rental Agreement not only the telephone number of the rental station is printed but you also find its address and the one of the returning station too. Please fill in the entire accident claim. In case of car breakdown please call 24 Hour Road Assistance (+351 96 245 7314 or +351 289 502 204), but if the car still runs please get to the nearest Company station and exchange the car. The telephone number is on the Company Rental Agreement and on this document as well as on the car key tag. WHAT RISKS ARE COVERED IN MY RENTED CAR? All our cars have Unlimited Public Liability coverage and 24 Hour Road Assistance. If your rental excludes Collision Damage Waiver (C.D.W.) and/or theft waiver (T.W.) and your car suffers total or partial damages or is stolen, the driver is considered totally responsible for the payment of the damages. If your rental includes Collision Damage Waiver (C.D.W.) and if the car suffers damages, the driver is held responsible for the payment up to the minimum excess charge (on the Company Rental Agreement you can find the minimum excess charge for your car). If the car or its parts are stolen and if your rental covers the T.W. you're only responsible for the payment up to the minimum excess charge. If you choose the SUPER C.D.W. coverage, if available, your responsibility in terms of excess charge is null, unless it's proven that the occurrence was due to negligent driving or under the influence of alcohol or drugs. The Company declines accidents not reported to the police, even if you choose the SUPER C.D.W. Please inquire our receptionist about the costs of the excess charges or consult our terms & conditions. WHAT SHOUD I DO IF I WANT TO EXTEND MY RENTAL? Please go to the nearest Company station and update your rental agreement. The vehicle that runs beyond the rental period mentioned on the rental agreement incurs in legal penalties which are entire responsibility of the driver. SHOULD I RETURN THE CAR WITH FUEL? The car should be returned with the same level of fuel as you found it at the beginning of your rental. If less, a refuelling service charge is applied in addition to the cost of the missing fuel. However, if you bought the tank option at the beginning of the rental (with a 10% discount), please return the car empty as you will not receive any reimbursement. Please inquire our receptionists for more information. WHAT MAY HAPPEN IN CASE OF EXCEDING LEGAL SPEED LIMITS? Avoid driving over the speed limits (90 Km/h). To reduce accident rate in the country, the Portuguese government implemented a control program on the main roads (Tolerance Zero). The fines are high and always of the driver's responsibility. IS THERE A STANDARD PROCEDURE THAT SHOULD BE FOLLOWED WHEN RETURNIG THE CAR? Make sure that the person that accepts the car is one of our receptionists. Control the car with the receptionist for damages and check with the Company Rental Agreement which indicates if there were any damages already when you rented the car. Make sure you do not forget anything inside the car. If you return the car at the airport before your flight, then you should do it at least 2 hours before flight departure. You need the Green Card for travelling abroad. Please inquire with our receptionists the cost of the Green Card.